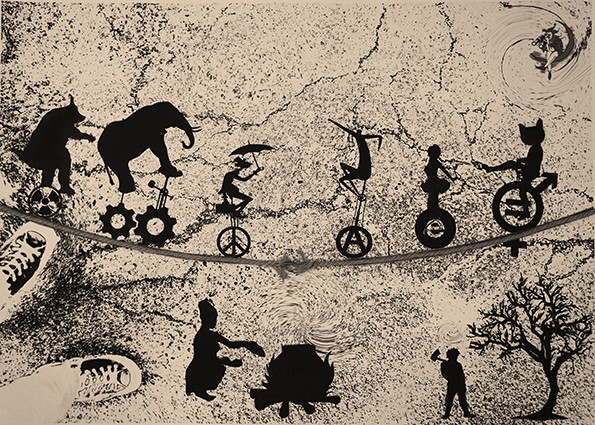 Black silhouettes of various animal and humanoid shapes rides tricycles along a rope, with its middle wearing out. 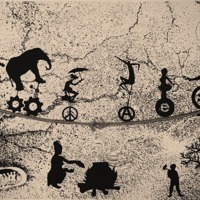 The wheels of the unicycles are replaced with the symbols for (left to right) radiation hazard, mechanical gears, peace, anarchy, internet explorer, and gender equality. Below the rope are silhouettes of someone cooking a meal over a fire and someone with an ax looking at a tree. A jester like figure watches with binoculars atop a crescent moon from the top right while on the bottom left is an outline of shoes and legs. Ramin Baniardelan, “untitled,” Peace Posters Dialogue Project, accessed April 23, 2019, http://peaceposters.oberlincollegelibrary.org/items/show/355.